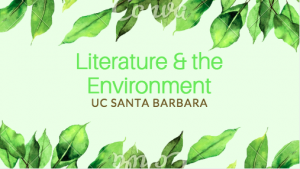 The Department of English at UCSB provides graduate students with a range of resources to aid in the study of literature and the environment. This begins with our extraordinary faculty, who approach environmental issues from a variety of diverse and exciting perspectives, spanning traditions from the Renaissance to contemporary Indigenous literatures, and Ocean studies to sylvan ecologies. There are also teaching opportunities available for graduate students interested in literature and the environment. As a means of specializing with this focus, graduate students may take the “Theories of Literature and the Environment” list as an option for the First Qualifying Exam, and declare the interdisciplinary Environment and Society emphasis. UCSB is one of the few U.S. universities that offers PhD students a comprehensive overview of the field of ecocriticism. All candidates for the PhD in English at UCSB must successfully pass two oral qualifying exams. Both of these may be vectored toward these themes since “Literature and the Environment” is one of the thirteen fields that the Department recognizes in its categorization of literary studies as a whole. In advance of the exam, students are required to read and prepare all three parts of the list. The second qualifying exam involves a ninety-minute conference with the student’s dissertation committee based on a prospectus and a bibliography of at least fifty works.